On a visit to London in 1984, Satyajit Ray had the occasion to watch Steven Spielberg’s Indiana Jones and the Temple of Doom while his own Ghare-Baire (The Home and the World) premiered at the now-defunct Academy Cinema. According to Andrew Robinson, Ray sat “impassively” throughout the film and “afterwards… admitted to feeling somewhat depressed that audiences seemed to enjoy such unrelenting action” (1). There is little to be mystified by in this reaction, and one only has to watch a film like Ghare-Baire to understand why. Even while he poeticises the passage of a train through his cinematic landscape in Pather Panchali (1955), Ray remains largely committed to a social-realist imperative in his cinema. 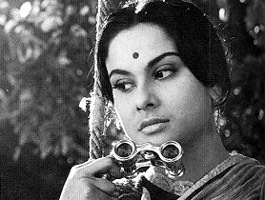 In 1966, following the critical success of Charulata, Ray wrote that he had chosen for himself “the field of intimate cinema… of mood and atmosphere rather than of grandeur and spectacle” (2). Subsequently, an assessment of his worth as an artist has often been inclined towards this intimacy in his films, especially when examined against the charging herd of popular Indian cinema. However, in Charulata there is evidence of a cinema born out of the exquisite love affair between intimacy and spectacle – and not spectacle in the “Indiana Jones” sense of the word, but an Ophulsian cinematic spectacle. Charulata belongs to that venerable category of films that unabashedly display their complexities, and are readily regarded as “exemplary” because of the delightful struggle involved in talking or writing about them. For several Ray enthusiasts – including my mother – it is the director’s masterpiece, a film that has been likened to Mozart’s music (but with little objective justification), and is cinematically “close to perfection” (3). Set in a late 19th century Bengali middle-class household, it revolves around Charu, a lonely and childless housewife, and her efforts to alleviate the ennui in which she lives. She is married to Bhupati, an affluent bhadralok (4), too consumed in disseminating Western liberalism through his English-language newspaper to pay any attention to his wife. The inertia is their marriage seems convenient until it is interrupted by the arrival of Bhupati’s cousin, Amal, who is full of youthful virtues – exuberance, poetic idealism, naivete. In his presence, Charu begins to reject her habitual proximity towards the Prachina (Conservative Woman) – a figure satirised by writers of the time as one who lolls around in bed, reads pulp fiction and only thinks of herself, and is typified by Charu’s sister-in-law, Manda. By contrast, as a Nabina (Modern Woman), Charu freely exercises an unassuming intellect and harbours a latent sexual attraction towards Amal. However, Charu spends most of the narrative oscillating between the Prachina and the Nabina; she is never quite one or the other. The film reaches its climax: Amal is unwilling to betray his cousin’s trust that has already suffered at the hands of Charu’s swindling brother, Umapada. He abruptly leaves, and after Charu hysterically submits to her disappointment in the presence of Bhupati, there is nothing left but for the forsaken woman and her humiliated husband to forge a contrived reconciliation. What begins as a seemingly straightforward character study quickly develops into a scathing critique of the social hypocrisies of the Bengali Renaissance (5). Charu becomes representative of a generation of women, encouraged to experience a sense of liberty and independence, but only within the andarmahal (inner sanctum of the house). Ray’s structural and aesthetic approach to the delicate complexities of his thematics and narrative deserves careful scrutiny, and has certainly not gone unnoticed, but for the sake of brevity it is perhaps appropriate to only highlight the key aspects of his strategy. In the opening segment of the film (roughly 7 and a half minutes), Ray takes full advantage of the cinematic apparatus at his disposal, in search of a “language entirely free from literary and theatrical influences” (6). Dialogue is almost done away with; sound cues and music are carefully selected and introduced with pin-point precision, and the action and camera movement are orchestrated to mediate between Charu’s reflective pauses and moments of acceleration. The end result is a wonderfully intricate, almost composed tableau that already discloses Ray’s thematic concerns as well as his formal approach. Two specific moments of this sequence deserve a brief mention – the first, when Charu animatedly scrutinises the life outside her windows through a pair of opera glasses. Used recurrently as a self-reflexive motif in the film, the glasses draw significant attention to the magnification of banal activity (the street, Charu’s boredom) into a spectacle, as well as making reference to an enforced spatial confinement (her restriction within the andarmahal, ours within our cinema seat). The second moment occurs towards the end of the sequence, when Bhupati walks past Charu in the hallway without noticing her. A momentary frame is created when Bhupati very briefly stops in his tracks to examine the book he is engrossed in. Charu is positioned a step behind within the frames of the ornate doors, implying an almost helpless vanity. The image, the pause, the positioning – all become highly symptomatic of the inertia that this relationship is based upon. In making the pause momentary, Ray projects this inertia as a trajectory, or the linear progression of a state of affairs, rather than a picture of complete stasis and inactivity. Charu’s condition is not something that just is, but rather something that continues to be, a persisting “sameness” hidden in the wings of a period of socio-political mobility. Significantly, when first released, Charulata was widely regarded as being slow and sluggish. Yet, it is a film that features continuous movement. Unlike in Ophuls’ Lola Montes (1955), the visual dissonance between the vigorously mobile and the inert protagonist does not translate into an agency-captivity/movement-passivity dialectic. Even while celebrating motion on a swing in her garden, Charu is never entirely mobile. The creaking of the branches as the ropes stretch against them is much too real. Having briefly taken flight, the bird must return to her broken nest. Tagore’s novella Nastanirh (The Broken Nest) on which Ray’s screenplay is based, ends with the Bengali word Thak (literally, “let it be”). In search of an equally meaningful cinematic resolution, Ray terminates his film with a striking freeze, reminiscent of Truffaut’s Les Quatre Cents Coups (1959). Charu and Bhupati stand captured in an inescapable moment of stasis, their hands outstretched towards each other in quiet recognition. Andrew Robinson, Satyajit Ray: The Inner Eye, Rupa, New Delhi, 1989, p. 9. Satyajit Ray, Our Films, Their Films, Orient Longman, New Delhi, 1976, p. 57. Ben Nyce, Satyajit Ray: A Study of His Films, Praeger, New York and London, 1988, p. 94. Bhadralok is a Bengali term for the 19th century bourgeois elite whose exposure to European literature, philosophy and science bred a profound enthusiasm for the liberal-humanist traditions of the West. Bengali Renaissance: A period in 19th and early 20th century Indian history in which there was a conscious effort to reform the restrictive and inhumane practices in society and religion; also a flourishing cultural atmosphere which produced the likes of Rabindranath Tagore and Bankim Chandra Chatterjee. Ray quoted in Robinson 164.